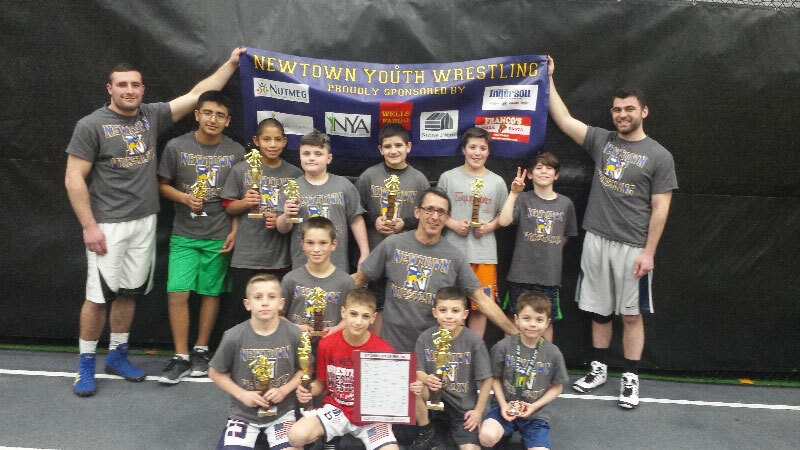 The Newtown Youth Wrestling program hit the mats at the Floyd Little Athletic Center at Hillhouse High School in New Haven for the State Tournament on February 26, one day after the Newtown High grapplers earned second place in the State Open at the same venue. With a record 24 youth wrestlers qualifying for the tourney, the youth program also had a strong showing at the event. When the dust settled, sixth grader Ben Plaue, fifth grader Danny Accomando, and fourth grader Shaun Daoust took home titles in their respective weight classes. This represented the third state title for Accomando and the second for Daoust. Many of the wrestling brackets were full, with 16 of the toughest youth competitors from around the state who qualified from four different qualifying locations. In addition to the state champions, Newtown came away with four wrestlers in second place: Jack Wendel, Adam Wright, Luca Manfredi, and Brendan McAnaspie. Marc Maurath, Jason Benson, and Carlos Loor each took home a third place trophy, and Brighton Karvoski was in fifth place in his weight class. These wrestlers compete for a New England Title in Salem, Mass. on March 11.